Code page 866 (CP 866; Russian: Альтернативная кодировка) is a code page used under DOS and OS/2 to write Cyrillic script. It is based on the "alternative code page" developed in 1986 by a research group at the Academy of Science of the USSR. The code page was widely used during the DOS era because it preserves the pseudographic symbols of code page 437 (unlike the "Main code page" or Windows-1251) and maintains alphabetical order (although non-contiguously) of Cyrillic letters (unlike KOI8-R). Initially, this encoding was only available in the Russian version of MS-DOS 4.01 (1990) and since MS-DOS 6.22 in any language version. Not identical, but two very similar encodings are registered in GOST R 34.303-92 as KOI-8 N1 and KOI-8 N2 (not to be confused with the original KOI-8). Each character is shown with its equivalent Unicode code point. There existed a few variants of the code page, but the differences were mostly in the last 16 code points (240–255). IBM code page 808 is a variant of code page 866; the only difference is the euro sign (€) in position FDhex (253) replacing the universal currency sign (¤). The original version of the code page by Bryabrin et al. (1986), called the "Alternative code page" (Russian: Альтернативная кодировка) to distinguish it from the "Main code page" (Russian: Основная кодировка) by the same authors. An unofficial variant with code points 240–255 identical to code page 437. However, the letter Ёё is usually placed at 240 and 241. Two variants from GOST R 34.303-92. The first one, KOI-8 N1, leaves several code points empty for further internationalization (compare with code page 850). The second one, KOI-8 N2, adds letters for Belarusian and Ukrainian. Code points 176–239 are identical to code page 866. Before Microsoft's final code page for Russian MS-DOS 4.01 was registered with IBM by Franz Rau of Microsoft as CP866 in January 1990, draft versions of it developed by Yuri Starikov (Юрий Стариков) of Dialogue were still called code page 900 internally. While the documentation was corrected to reflect the new name before the release of the product, sketches of earlier draft versions still named code page 900 and without Ukrainian and Belarusian letters, which had been added in autumn 1989, were published in the Russian press in 1990. Code page 900 slipped through into the distribution of the Russian MS-DOS 5.0 LCD.CPI codepage information file. ^ "Code Pages Supported by Windows: OEM Code Pages". Go Global Development Center. Microsoft. Retrieved 2011-10-11. ^ a b (in Russian) Брябрин В. М., Ландау И. Я., Неменман М. Е. О системе кодирования для персональных ЭВМ // Микропроцессорные средства и системы. — 1986. — № 4. — С. 61–64. ^ (in Russian) ГОСТ Р 34.303-92. Наборы 8-битных кодированных символов. 8-битный код обмена и обработки информации. = 8-bit coded character sets. 8-bit code for information interchange. ^ "OEM 866". Go Global Development Center. Microsoft. Retrieved 2011-10-17. ^ "CP 00866". IBM Globalization. ^ "CP 00808". IBM Globalization. ^ (in Russian) Фигурнов В. Э. IBM PC для пользователя. — 2-е изд. — М.: 1992. — С. 279. ^ "CP 01025". IBM Globalization. ^ "CP 00848". IBM Globalization. ^ (in Ukrainian) РСТ УРСР 2018-91. Система обробки інформації. Кодування символів української абетки 8-бітними кодами. ^ "CP 01031". IBM Globalization. ^ "CP 00849". IBM Globalization. ^ "CPIDOS - CPX files (Code Page Information) Pack v3.0 - DOS codepages". FreeDOS. ^ Starikov, Yuri (2005-04-11). "15-летию Russian MS-DOS 4.01 посвящается" [15 Years of Russian MS-DOS 4.01] (in Russian). Archived from the original on 2016-12-03. Retrieved 2014-05-07. 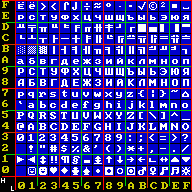 The Main code page (Russian: Основная кодировка) is an 8-bit code page used in DOS. It was devised in 1986 by a research group at the Academy of Science of the USSR. The other code page by the same group is known as the "Alternative code page" (Russian: Альтернативная кодировка) which is nearly identical to code page 866. Unlike the latter, the "Main code page" does not preserve the code points of the pseudographic symbols of code page 437. However, the majority of software at that period were made to be compatible with code page 437, as a result the Main code page has never gained any wide use. With the introduction of the Russian version of MS-DOS in 1990 which by default uses code page 866, the Main code page has become obsolete. Neither IBM nor Microsoft have ever supported this code page, so it has not been given its code page number by any vendor. The Main code page was hardwired in some Soviet IBM PC clones such as ES PEVM or Iskra-1030 (however, other Soviet computers such as UKNC generally used KOI-7 or KOI-8). The cells B0–EF seem to be the origin for the same rows in ISO/IEC 8859-5. Sha (Ш ш; italics: Ш ш) is a letter of the Glagolitic and Cyrillic script. It commonly represents the voiceless postalveolar fricative /ʃ/, like the pronunciation of ⟨sh⟩ in "sheep" or the somewhat similar voiceless retroflex fricative /ʂ/ in Russian. More precisely, the sound in Russian denoted by ⟨ш⟩ is commonly transcribed as a palatoalveolar fricative but is actually a voiceless retroflex fricative. It is used in every variation of the Cyrillic alphabet for Slavic and non-Slavic languages.In English, Sha is romanized as ⟨sh⟩ or as ⟨š⟩, the latter being the equivalent letter in the Latin alphabets of Czech, Slovak, Slovene, Serbian, Croatian, Latvian and Lithuanian. Shcha (Щ щ; italics: Щ щ) is a letter of the Cyrillic script. In Russian, it represents the voiceless alveolo-palatal fricative /ɕ(ː)/, similar to the pronunciation of ⟨sh⟩ in sheep (but longer). In Ukrainian and Rusyn, it represents the consonant cluster /ʃt͡ʃ/. (This is also the sound it is normally taught to English speakers as because it is easier to distinguish from Sha's sound.) In Bulgarian, it represents the consonant cluster /ʃt/. In Kurdish, it represents the consonant /d͡ʒ/. Other non-Slavic languages written in Cyrillic use this letter to spell the few loanwords that use it or foreign names; it is usually pronounced /ʃ/ and is often omitted when teaching those languages. In English, Shcha is romanized as ⟨shch⟩ or ⟨šč⟩ (with hačeks) (occasionally ⟨sch⟩, all reflecting the historical Russian pronunciation of the letter. That can lead to some confusion, as the ⟨ch⟩ in the transcription may seem to indicate that Щ is a combination of Ш and a strong Ч, which is true in Ukrainian but not Russian, where this sound is always more softened. The letter Щ in Russian and Ukrainian corresponds to ШЧ in related words in Belarusian. For the sound in English sometimes represented by ĭ, see near-close near-front unrounded vowel.Short I or Yot (Й й; italics: Й й) is a letter of the Cyrillic script. It is made of the Cyrillic letter И with a breve. Short I represents the palatal approximant /j/ like the pronunciation of ⟨y⟩ in yesterday. Depending on the romanization system in use and the Slavic language that is under examination, it can be romanized as ⟨y⟩ (the most common), ⟨j⟩, ⟨i⟩ or ⟨ĭ⟩ (probably the least common). For more details, see romanization of Russian, romanization of Ukrainian and romanization of Bulgarian. Short U (Ў ў; italics: Ў ў) is a letter of the Cyrillic script. The only Slavic language using this letter is the Belarusian Cyrillic script. Among the non-Slavic languages using Cyrillic alphabets, ў is used in the Dungan language and in the Siberian Yupik language. It was also used in Uzbek before the adoption of the Latin alphabet in 1992. Tse (Ц ц; italics: Ц ц) is a letter of the Cyrillic script. It commonly represents the voiceless alveolar affricate /ts/, like the pronunciation of ⟨zz⟩ in "pizza". In the standard Iron dialect of Ossetic, it represents the voiceless alveolar sibilant fricative /s/. In other dialects, including Digoron, it has the same value as in Russian. In English, Tse is commonly romanized as ⟨ts⟩. However, in proper names (personal names, toponyms, etc.) and titles it may also be rendered as ⟨c⟩ (which signifies the sound in Serbo-Croatian, Czech, Hungarian etc. ), ⟨z⟩ (which signifies the sound in Italian and German), ⟨cz⟩ or ⟨tz⟩. Its equivalent in the modern Romanian Latin alphabet is ⟨ț⟩. Ze (З з; italics: З з) is a letter of the Cyrillic script.